The wig I use is a Mona Lisa Collection wig. I don't know which model it is (the tag doesn't say), but you can probably find it online somewhere. I happened to come across it at a kiosk at a local mall. I think I paid around $30 USD for it. The wig works great. It has a nice color and a somewhat realistic hair texture. It doesn't look like those cheap wigs that are really shiny. 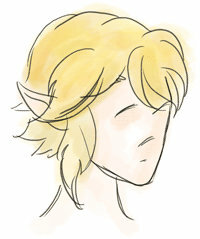 The only thing it was missing was the side burn hair that Link has that dangles on the sides. I was able to add this myself in a few easy simple steps. For this, you'll need some scrap cotton like fabric such as muslin, thread (any color), a sewing machine, your wig, and another wig to cut hair from. You'll need another wig of a similar color with long hair that you are willing to cut pieces from. I happened to have a wig that I was using for spare hair already. It is a much cheaper wig that I paid about $20 for and has much longer hair on it. Next you'll need to cut a chunk of the hair from your spare parts wig. Be sure that it is a few inches longer than you want it to hang. The reason for this is you'll be folding the hair over to make the hair less likely to come out of the stitches. 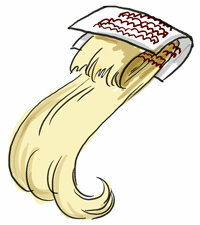 Then, lay down the hair on a strip of muslin or similar fabric with an inch or so hanging off of the strip. It doesn't matter a whole lot what color the fabric is because it wont be visible. Then set your sewing machine to a strait stitch at the smallest stitch setting. Then just start stitching back and forth like crazy. You'll need to go over the area several times to make sure the hair doesn't come loose. Once you do that, fold the fabric in half so that the other end of the hair is pointing down. Now stitch some more with your sewing machine. Doing this helps to keep the hair from coming out. Trim some of the excess hair from the folded end. Once you've got your strip, you can sew it to your wig. Just hand sew it into place where you want it. The black thread is from the sewing machine. You can see how much I stitched back and forth. The red at the bottom is where I attached the strip to the wig. You'll likely want to trim the hair to give it a more natural edge. Don't just go strait across. Give it some layering. And that's all there is to it! Now you can look smexy just like Link. I had mentioned in a previous blog post a bit about the troubles I had with my last attempt at making Chain Mail for my Twilight Princess Link costume. I just got my new rings today and wanted to give an update on the status. The first thing I tried was to buy galvanized fencing wire and make the rings myself spinning the wire on a dowel rod connected to a power drill. I bought many of the supplies but a friend of mine with experience making maille talked me into buying my rings online instead. I purchased 14 gauge 1/4inch diameter rings from TheRingLord.com in Brass. While I was pleased with the color, I had trouble working with the rings. It was quite difficult to put two 4-in-1s together and it was almost impossible to put two lengths together. I attempted to just do a 4 ring tall length around the trim of my tunic but the weight of the metal was too much and made the tunic sag. So then I decided to order rings at a higher gauge (thinner) with a larger diameter, again from TheRingLord.com. I went for the 16 gauge 3/8th inch brass rings. They arrived today and already I've created almost the same amount of maille that took me weeks to do with the 14 g 1/4inch rings. My only concern is that since the 16 G is so thin, its hard to meet the edges when closing the rings and there is opportunity for some of the rings to come undone. I'm also not sure how well it will all hold once I make a whole suit out of it. The suit will probably end up being super light. Which is good since I'll be wearing the costume all day long at the con. If I run into problems with the new maille I will post it in my blog. If I could go back in time and change my order, I'd probably go with the 14 G 3/8th rings instead. At the rate I'm able to make the maille, I can probably have the shirt and the skirt done in time for AX. Below is a picture showing the 14 g 1/4th inch rings against the 16 g 3/8ths at the bottom. I think the smaller rings look more like real maille since there isn't as much gapping. But I think this is good enough for a costume. Again, note that the top half took me weeks to make where as the bottom half took me one night. Yesterday was Drawing Day! What's Drawing Day? Well its basically a day that this guy made up to promote drawing and more online art community activity. Which I thought was pretty cool so I enrolledPaperDemon as an official participant in the event. We were listed as a Gold Supporter because of the prominent exposure we had on our site for Drawing Day. I had so much fun at FanimeCon this year that I decided to go with some friends to AnimeExpo in LA. So if you'll be attending that con, be sure to look for me! I signed up for a photo shoot with Consplayers.com to get some nice professional photos of my costume. This means there's even more pressure to make sure my costume looks fantastic. There are a couple things I will attempt to fix in my Link costume before the con. First, my gauntlet is a piece of crap. Every TP Link at Fanime had a better one than me. I found a great tutorial online for making a similar armor piece out of craft foam. I've also got my acrylic paint handy for adding details and weathering. Plus this should not take too long to make compared to other parts of my costume. Secondly, the hilt of my sword. The blade looks fine but the hilt is not the right shape or color. I'd like to see if I can figure out a way to make a better hilt out of craft foam. I remember going to a panel in 2001 at Fanime hosted by the Stitchin' Babes in which they described their process of making props out of craft foam. But it's not the same method as described on many tutorials online. Theyactually glued layers and layers and layers of craft foam together. Then carved it the way they wanted, sanded it to get finer smooth shaping, then sealed it and painted it. The result was a very light weight 3D weapon. You could use this method for creating really big props. Unfortunately, I don't have all the details of this technique and have not had much luck finding a tutorial for this process online. I did find a tutorial though on using craft foam for making armor but this isn't the same process because it doesn't involve gluing many many layers and carving them. Perhaps I could give it a try on my own. I think my biggest question is what glue to use. What kind of glue would be able to hold multiple layers of craft foam together without falling apart when being carved/sanded? The next thing is the chain mail. I did start some chain mail a couple months back but it failed because the rings were too thick and too small to work with to create a big enough length. So I've ordered some thinner, bigger rings. I know the pattern fairly well now so I think I can make the mail pretty fast and easily. I wont make a whole shirt, just enough for a half shirt for the parts that show. I will update my blog with relevant news on my costume in the coming weeks. Only three more weekends left until AnimeExpo! It had been 5 years since I last went to FanimeCon. I was surprised by the number of cosplayers. I think most people were in costume of some kind. Back when I first started going to the con, maybe only 15-20% of attendees cosplayed. I was also impressed with the quality of the cosplay. Most of the cosplay I saw back when I first went to Fanime in 2001 was really crappy. They were mostly costumes people put together at the last minute. But this year a lot of people had really fantastic costumes. I took almost 300 pictures at the con. Seeing all of the greatcosplay really inspired me to want to make more costumes and do even better next time. My favorite costumes were the creative ones. Like this costume of Cloud in drag. Remember the part in Final Fantasy VII where you have to dress Cloud like a girl so he can pass as a prostitute? Popular cosplays were Naruto series, Mario brothers, Legend of Zelda, Chobits Persacomps, characters from Final Fantasy VII (mostly the new generation stuff like advent children and the new spin off games). Link was popular and I think I got a photo of almost every single one at the con. I saw Links from Wind Waker, Twilight Princess, and Ocarina of Time. There was even a WW Link in his pajamas which was super cute. And whenever Link and Zelda stood next to each other, the cameras started shooting like crazy. I saw three Princess Zelda's at the con and they all looked great. But I think this one was the best one. There was one Link in particular that I had a couple of memorable moments with. I took a photo of him and then my friend Potter said I should get a photo of the two of us battling. I asked him "Hi Link, can we battle?" And he said, "Oh... No sorry" and I said "No, I mean for a photo." And he said "Oh!Ok !" I guess he was afraid of me and thought I meant to really fight? One other time, my friends and I and some other people were on a crowded elevator. It stopped at a floor and the same Link walks on and Potter jokingly says to him "Oh sorry, no Links allowed on this elevator." And he walked off of it! Everyone felt bad for him. Link, I'm sorry my friend was so mean to you! If there's one thing I've noticed, it's that girls LOVE Link. If you are a guy and want to get some love at the con, cosplay as a decent Link and random girls will glomp you and hug you. I think I got hugged by 30 different girls and even a few guys. A lot of people wanted to get their picture taken with Link also. 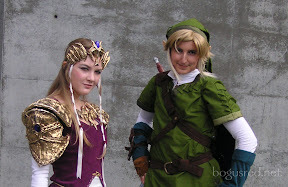 I really enjoyed playing the part of Link and getting my picture taken. Though I think I could have done some better poses. I look too girly in my pictures. I will practice some better poses before the next con. There was this one group of girls that kept sneaking up behind me and yelling "Hey! Listen!" It wasn't until the third time that I finally got what they meant. They were imitating the annoying fairy, Navi, from Ocarina of Time who always says "Hey! Listen!" When she has something important to say. Other hi-jinks were abound at the con as well. There was a game of "Link tag" going on Sunday at one point. So I'm feeling depressed that the con is all over. I'm starting to make plans with my friends to attend AnimeExpo in July. I'm also starting to think about what to cosplay for next year. I'd like to do what i did last time and create my costume for Halloween then reuse it at Fanime. So far my plan is to create an Ike (from Fire Emblem) costume for Mike to wear. I may create a simple costume for myself or I may not even go through the trouble of creating a new costume. I have so many other projects right now I shouldn't start another one. My Link costume still needs some work. My arm guard thingy that goes on the sword hand looks like total crap. I put it together really quickly so that's why it looks crappy. I will work on an improved version before the next con. I also want to try and create a new hilt for my sword. The chain mail situation doesn't look good. I had created enough for the rims of my tunic but when I attached them it made the tunic sag and look awful so I ended up not using it at the con. I tried making a wider length of mail but with the gauge and size of the rings I'm using its really difficult to link them together. So I'm going to start over with bigger, thinner rings. I've signed up for a photo shoot with Consplayers.com at AX. Hopefully I'll have all the tweaks and the chain mail done by then.